If you're searching for an easy-care, low-maintenance perennial to brighten up your sun-filled landscape, look no further than Johnson's Blue Geranium. This gorgeous plant is a dependable bloomer that bears luxuriant clusters of pretty, blue flowers—and they keep coming for several months! 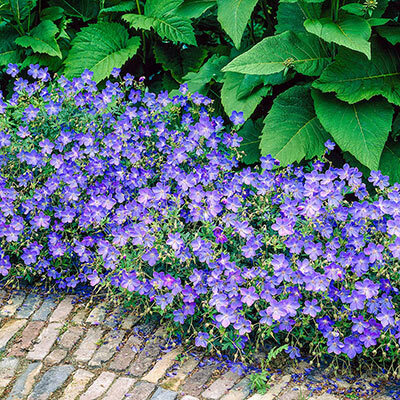 Due to its reliable growth habit and long bloom time, Johnson's Blue Geranium is quickly becoming a favorite for planting in cottage gardens, seasonal borders, mixed containers and even as a ground cover. Sky-blue flowers grow up to 2 inches wide and bloom atop fine, rich green foliage from late spring to early fall. Grows 12-18 in. tall with a 24-30 in. spread. Attracts butterflies. Deer tend to avoid. For best results, plant in full sun to partial shade. Zones 4-8. Zone 4 - 8 (-20° F.). Light Requirements Full sun where cool in Summers, shade in hotter climates. For each offer ordered, get 3 bareroot. 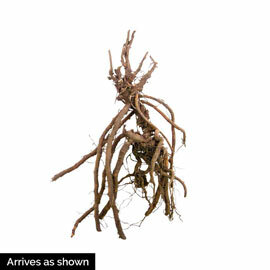 Depth: Plant with crown at soil surface. Sun/Shade: Full sun where cool in Summers, shade in hotter climates. Color: Clear blue. Vivid clear blue with tinged pink centers. Foliage: Deeply lobed and ancisely toothed foliage. Attractive palmate - dark green, 2 - 8" wide. Blooms: Early summer main display and will repeat blooming later in the season. Soil Requirements: Moist well drained soil. Growth Rate: 12 - 24 inches. Pruning: Can cut back in mid summer to rejuvenate. Size: 1 1/2 - 2 inches wide.